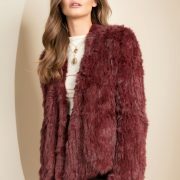 The Bubish Valencia Burgundy Fur Jacket is an essential luxe layering piece for every woman’s wardrobe. Bringing an effortless look to any outfit being slightly less fitted and oversized with a draped open front and full back, this jacket is a must have wardrobe piece. The ideal work-to- play jacket ensuring comfort but also effortless style carrying you from day to night. *Bubish’s Rabbit Fur is the by-product of the meat industry. Bubish does not cause any harm to animals and sources the hides from a reputable supplier. Receive your gorgeous Jacket brand spanking new. All of our items have NEVER been tried on before…So you can shop with piece of mind that you are getting a quality item that has never been worn.